Create Creates an HTML-encoded string using the specified text value. ToHtmlString Returns an HTML-encoded string that represents the current object. 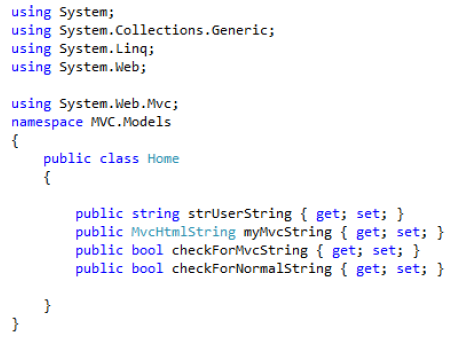 The Create method of the MvcHtmlString class in System.Web.Mvc namespace creates an HTML-encoded string using the specified text value in the parameter. <%: %> is a new syntax for HTML Encoding output in ASP.NET 4 and ASP.NET MVC 2. This syntax renders output like <%= %> blocks do, but at the same time, also automatically HTML encodes it before rendering. Considering that ASP.NET 4 introduced a new IHtmlString interface (along with a concrete implementation: HtmlString) that a developer can implement on types to indicate that its value is already properly encoded for displaying as HTML, and that therefore the value should not be HTML-encoded again, a possibility of Double Encoding arises when <%:%> and instances of IHtmlString are used together. To avoid this, <%: %> code-nugget syntax checks for the presence of the IHtmlString interface implementation and will not HTML encode the output of the code expression if its value implements this interface. This syntax automatically encodes value that is represented by <…>. Only exceptions will be when <…> is of MvcHtmlString type. <%: NormalString %> <%:%> will Html encode the NormalString before rendering the same. @model. <somethingNonMvcHtmlString> This will be HTML encoded and rendered. @model. <somethingMvcHtmlString> This will be not get HTML encoded as this is assumed to be already encoded somethingMvcHtmlString is already assumed to be encoded. So why document these when these details are already available in MSDN/TechNet/web? 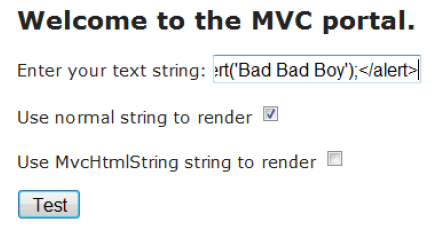 Because MvcHtmlString.Create method is not generating an HTML-encoded string as documented. And when these strings gets rendered within the <%:%> or @model.<…> syntax, they are not encoded and as a result a non-encoded string gets rendered into the browser. 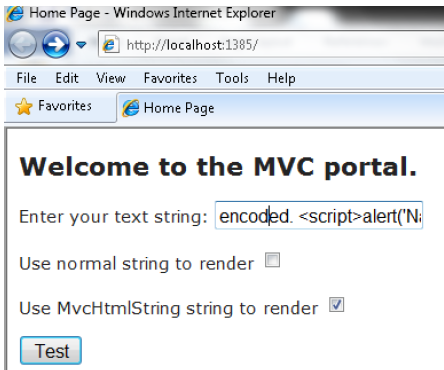 A small MVC 3 application is created just to check the workings of the Create method of MvcHtmlString class. 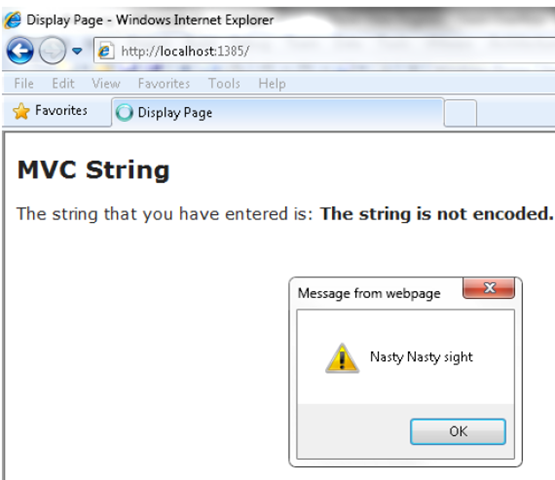 The strUserString is a normal string object. Now to check the encoding behaviour, we pass some script values and try to render it in the browser. 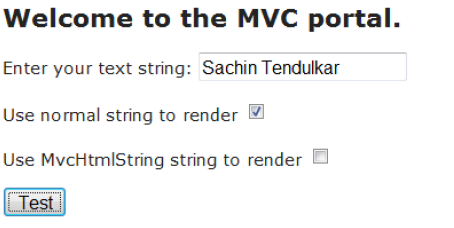 The MvcHtmlString.Create method did not encode the string as documented. This needs to be taken care of during code reviews particularly when values of type MvcHtmlString is rendered within the <%: %> code nugget expressions or in @Model.<…> in ASP.NET 4 and ASP.NET MVC 2 onwards. <%: %> and @Model.<…> will NOT automatically encode an object of type MvcHtmlString. 1. Check for <%: %> and MvcHtmlString usage. 4. If the type is normal string, <%: %>/@Model.XXXX will HTML encode the value. But if the type is MvcHtmlString then the value rendered within <%: %> will not be encoded. So if you see <%: %> in code do not assume that every value within it is encoded by default. ValidateRequest is a good feature that ASP.Net provides to help developers to code well to protect their applications against the menace of the all prevalent web application security issue – XSS. So it is not a very good idea to put too much trust on validateRequest to do the magic of input validation for an application. It can be easily and effectively bypassed. Hi there…I have been looking around for XSS related information and most of the demos I saw are either around displaying an alert in a web page or too advanced for a beginner like me. So as a toddler in the security world I tried to create my own dummy application to see how this attack is executed. What I write below is a documentation of my learning: there may be faults as I am still learning. So feel free to drop a comment incase anything is not correct, I will surely incorporate any suggestions. 1. We have a simple web forum that uses Form based authentication. 2. The users can comment on the topics discussed by other users. 3. New users visiting this site are required to register by creating a new user name and password. 4. A registered user can: view/write the posts, write comments on the posts and view the comments written by other users. 5. The following code snippet is added to the web.config file for this application. Please note that when request validation is disabled, any content can be submitted to a page; it is the responsibility of the page developer to ensure that content is properly encoded or processed. 1. A malicious user registers and logs in to the forum. To a normal user this looks like a perfectly harmless piece of text that directs you to another location that has more information around, eh…well Cross Site scripting exploit! 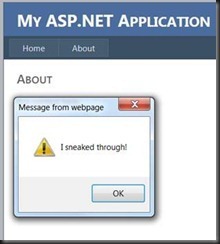 In our example we used a simple alert statement but in real world scenarios this can contain scripts that can steal your cookie, other important information, etc. These stolen information can be used to impersonate a user, launch a more knowledgeable attack on the application or its user and also can case loss of data that can have financial and reputational implications on both the end user as well as the web site owner. Hope someone will find this useful to understand how XSS can be exploited. I will posting my rendezvous with XSS.